So, you thought we were finished with the Deuell/Hall race and SB 303 for a while now that the run-off election is over, didn’t you? So did I. Silly us. It turns out that PolitiFact ran a little article on whether Texas Right to Life’s ad that Deuell managed to pull off the air briefly was accurate. Initially, PolitiFact said it was “mostly false.” Then, later, had to correct its own facts (isn’t that rich?) because it got a key word wrong and upgrade the rating to “half true.” Well, for reasons we’re about to get into, the half truth comes from the nature of PolitiFact’s “reporting” and I aim to set yet another record straight having done a little investigation of my own. You’re about to have the “full truth” a rating that PolitiFact doesn’t have. But I do. You cannot find the original article on PolitiFact and when I read it I was not initially going to post on it because it was just so ridiculous. Later, however, I noticed Deuell supporters, including a pro-life group gleefully tweeting it and putting it on their Facebook page as if PolitiFact actually vindicated its support of SB 303 and Deuell. Hardly. Indeed, what PolitiFact unknowingly did – as well as these passive euthanasia supporters – is give us a very important, very clear insight into the mindset of those that support these hospital panels that have the authority to make life and death decisions for you, against your will, and with total legal immunity. These are the same cast of characters that supported – and continue to support – SB 303. That is the forest that PolitiFact (and those gleeful users of the original link) missed while looking at the “faceless” trees. But that is the forest we’re going to delve into. 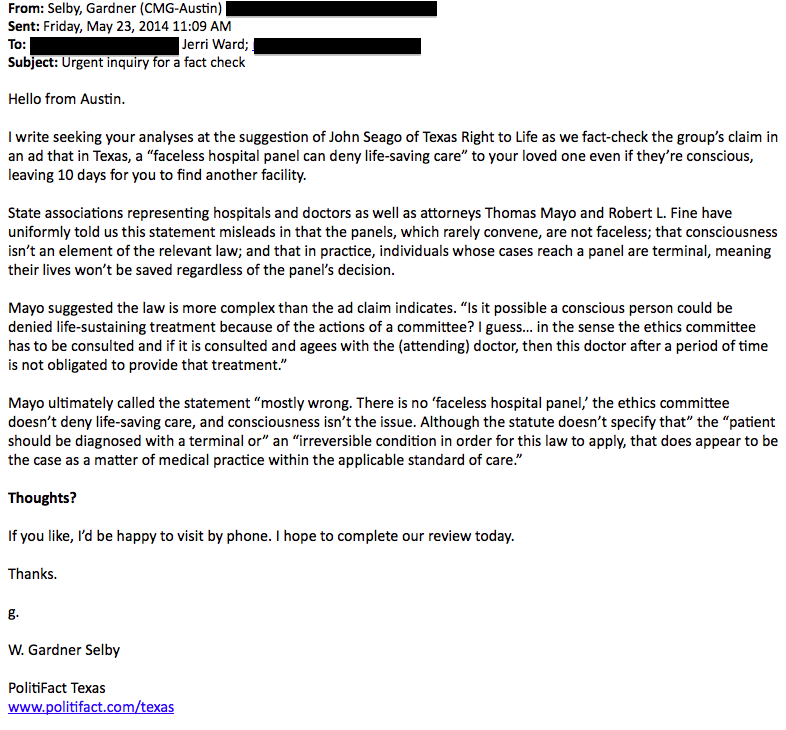 PolitiFact sought to determine the truth of this statement in Texas Right to Life’s ads opposing Bob Deuell’s re-election: In Texas, "a faceless hospital panel can deny life-sustaining care, giving you only 10 days to find another facility for your mother, dad, or young child, even if the patient is conscious." First, PolitiFact cannot even get the terms it was trying to disprove correct. Watch the ad, then read the article. You will note immediately that PolitiFact initially used the term “life-saving” care rather than what the ad really said which was “life-sustaining” care. It is extremely important in the sense that an organization that claims to prove or disprove the truth of something cannot even get the terms of its premise correct. Note: The ad has a narrator reading the words that are on the screen. Between hearing and seeing the verbiage of the ad, PolitiFact still did not get it right. Then note that its analysis and quotes from the “experts” and hospital staff discussed their take on the provision or not of “life-saving” care. After this term is completely wrong, PolitiFact still uses its reporting based on that rather than either entirely pulling the story or going back and asking the right question with the right terms of those who were interviewed. Only one pro-panel expert discussed the term "life-sustaining" and he admitted that such care could be withdrawn by the hospital committee, which the article also acknowledges that life-sustaining care includes artificial nutrition and hydration under the law. Second, even taking this article, as biased as it is, at face value, it is hardly a refutation of the criticism rightly directed at hospital panels, SB 303, and TADA. The article makes clear that the description of the law is accurate. Indeed it concludes, "We see how one could construe this scenario from the law, which doesn't specify how hospital review panels should be composed or run." (Emphasis added.) Of course, that is not the full story, but you'll get that here. The article then makes very clear that it took the word of doctors (themselves hardly unbiased in this matter, see all the TMA tweets about this that I have posted already), hospitals, and other "experts" interested in protecting the law and its effect over the language of the law itself and the experience of attorneys who have actually worked on these cases, where the identity of the panel was not always made known. PolitiFact had more information on this than it disclosed. Now, compare how much of what she said above to what they included in the final article versus how much time was given to the pro-hospital panel crowd. PolitiFact focused on the term "faceless,” which, it turns out was accurate and PolitiFact had evidence to fully support it but suppressed it instead and basically took the word of lobbyists and other stakeholders in the existing law and SB 303 (which would have maintained this aspect of existing law). PolitiFact even relies upon that silly sheet that the TMA put out for its members about how great SB 303 was. I discussed it here without mentioning it by name. It talks about the non-discrimination provision, a few more days to find care, free paperwork, and allowing more family members into this life and death deciding meeting. I pointed out why that was form without substance because ultimately, they can still withdraw care against your will. And, as it turns out, this was a point that was only emphasized by PolitiFact’s reporting. PolitiFact’s real focus should have been the withdrawal and denial of life-sustaining care rather than on the “faceless” nature of the committee. “Faceless” was used at least 11 times in the article. I am fascinated by the fact that it is what this was mostly about. It turns out that characterization is true. But in the end, does it matter? If you know everyone by name on that panel, does it lessen the sting of their decision to withdraw food and hydration from your loved one so that you can watch them die of starvation and thirst? But then, that's fairly typical when discussing TADA by those who have become advocates for continuing what it does. Avoid the real heart of the matter - denial of care - and the effects of those decisions. But that’s not what this blog is about. Let’s dig deeper. On another front, Kroll said, "we’re not talking about life-saving care. In most of these instances, it’s a situation where the person is dying. They are not going to walk out of that hospital even if they are conscious. They’re in the end of their life--maybe minutes, days, hours… But they’re not somebody who has gone in for a knee replacement and the hospital is just tired of dealing with them and is going to kill them, as an example," Kroll said. Let’s parse this for a moment. Kroll is using as an example a patient with a knee replacement as a person who the hospital would not kill because it is sick of dealing with this patient. OK. Back up and look at the first part of this quote. If that is the kind of patient that the hospital would not do this to, then the already dying patient is subject to this attitude and the resulting decision to withhold care. LOOK AT THAT LANGUAGE! The person is dying anyway, they are unworthy of care until nature takes its course, we will withhold life-sustaining care – including nutrition and hydration – because they’re just not worth it anymore. In her words, “the hospital is just tired of dealing with them and is going to kill them” unlike the knee replacement patient. Wow. Just. Wow. Let’s parse this: Withdrawing care from a child that a hospital or doctor has determined is "futile" which will - by these very words - hasten their death because the hospital has decided that there's no point in someone living a moment longer. How anti-life. How inhuman. We don't put people down like sick animals. At least, morally, we are not supposed to. 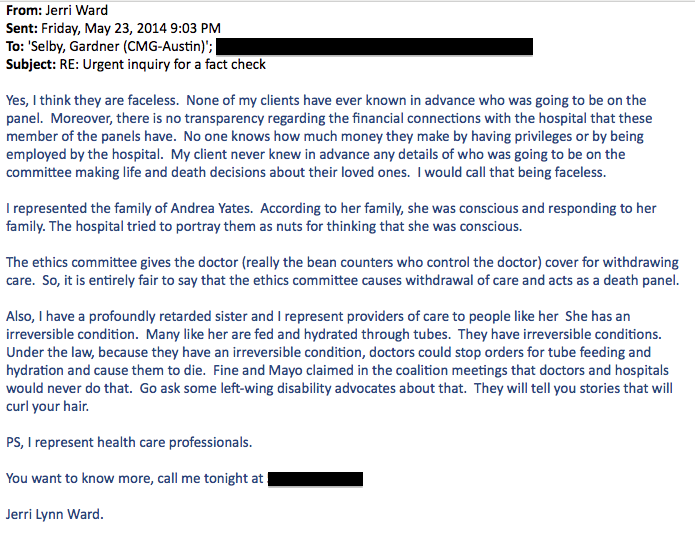 Also note that Graf said the committee was not faceless, commented that the family comes in “and pleads their case” and then said that “she has never seen a patient in such circumstances who was aware of their surroundings.” (Emphasis added.) NOTE: She’s in the pediatric unit. Even if this were limited to unconscious patients – which it is not either in law or practice – that would not make it correct, morally or otherwise. The most feeble among us, the sickest among us, the smallest and weakest among us, need our protection the most. That those in the business of providing medical care no longer see that is a very loud alarm sounding. We need to heed it. Further, the article said based on Graf’s description, "After a panel decides more care is unwarranted, usually after a meeting that runs several hours, the family is given at least 10 business days to act…” (Emphasis added.) You’re sick, we say you’ll die, we’re withholding care including artificial nutrition and hydration. Your family “pleads their case” but in the end, the committee decides and your loved one’s death is hastened. Friends, this is the language and attitude of euthanasia. This language of euthanasia is consistently used by supporters of the current law and SB 303. We call this “passive euthanasia” because it is the denial of care that hastens the death. “Euthanasia” itself – what I’ll distinguish by calling “active euthanasia” is where medication is given to kill the person. A lethal injection, if you will. We are quickly headed in that direction. More on that in just a bit. But let's spend some more time thinking about that language above: "we’re just prolonging their deaths" if further care is continued. Not prolonging their lives. Life is not the concern. Clearly. What horribly anti-life language, but I've heard it used (and read it used) by pro-SB 303 advocates, TAL members, and even, yes, the Texas Catholic Conference. I wrote about the use of this language in a letter sent out by the Executive Director of the TCC this year. Bishop Gracida posted my remarks on his blog here. SB 303 would not have affected the final outcome of these hospital ethics panel/committee meetings. There was still no recourse to challenge the underlying denial of treatment decision; there was still total immunity for the doctors and hospital, which we just recently went over again and again and again. Are you kidding me? The nursing staff is urging the doctor to withdraw care – which includes artificially administered nutrition and hydration! Is that supposed to inspire confidence? Morally justify this behavior? Shift blame and responsibility to the nurses? What? I’m baffled by it but it does make clear that care is withdrawn when the doctor – or other alleged medical providers – and committee agree that it is futile. You’re dying, you’re sick, you’re suffering, we’ll starve you to death. That, it appears, makes perfect legal and moral sense to these people. Well, it doesn't to me. And, I pray it does not to you. And, I pray that those who should be protecting life come to their senses about this before we slide further down the slippery slope to full on euthanasia where we just give someone a lethal shot of something to “put them down” like an animal. Think I’m overreacting? Nope. There are already efforts underway. I’ll be writing about this more because we must clearly understand the morality of these situations so that the correct and consistent pro-life ethic is followed. And, it is easy to lose one’s way. I have seen it too often and most recently with the Marlyse Munoz case. But that is for another post on another day. Today I point those cases out because PolitiFact gave us an overview of some of those issues. So, thank you, PolitiFact. This article does not provide the vindication that I think the gleeful posters and tweeters of it thought it would, but it is great insight into the mindset of those promoting passive euthanasia in Texas (the gateway to active euthanasia) – the doctors, hospitals, professors, lawyers, Catholic groups, and, yes, certain pro-life groups. They advocate for the continuation of a system where a hospital ethics committee determines even after you “plead your case” that they will withhold care – including artificially administered nutrition and hydration – and there is nothing you can do but try to find another facility – within 10 days or they can withhold care after then (unless you can meet a very high burden before a court that you can find another facility and maybe get a few more days). Advocacy for SB 303 was advocacy for the continuation of the withdrawal of care which does hasten death, including through the starvation and dehydration of the patient. Returning one more time to the article: “Fine also said: ‘I can’t promise you there’s not some rogue hospital or committee out there. But the question would be why isn’t the family taking that’ result ‘public?’” (Emphasis added.) I can answer that question. Because PolitiFact is not the only media source that reports this way. Texas Right to Life, Jerri Lynn Ward, and others have tried to call attention to this situation for years. But other “pro-life” organizations and organizations like the TCC keep saying that it’s all fine and dandy so long as we don’t unnecessarily prolong death, which is really saying that they don't want to prolong a life because they've decided for you that that life is not worth living. So, “half true” is the ruling – but that ruling is based on PolitiFact’s own biased reporting, asking the wrong questions, ignoring what did not suit the answer it wanted, and ignoring the really big issue – that hospital panels can cause the death of your loved one through denying life-sustaining care. Telling. Remember this when you look to them for the “truth” next time. For me, there won’t be a next time. Let this be yet another lesson about finding the truth on our own. This is another entity that cannot be relied upon. If in reading this it does not chill you to your core, I suggest you have some pro-life soul-searching to do.